We are broadly interested in understanding how predators shape ecological communities as agents of prey mortality and behavioral modification (i.e., in predator effects) and how predator populations and their ecological roles respond to anthropogenic exploitation and landscape modification. 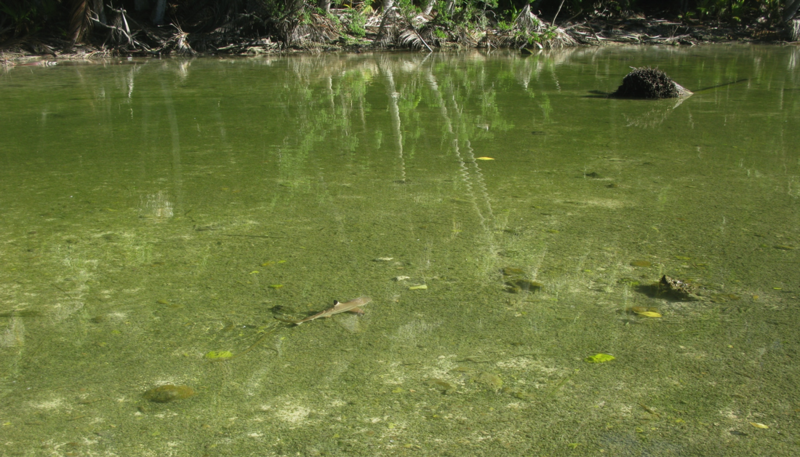 We pursue these interests primarily with field work in aquatic and terrestrial systems (click on 'publications' tab). Some specific research topics on which our research program is currently focused are listed below. Prey often modify their behavior in response to the threat of predation. Such anti-predator behavior can alter patterns of resource exploitation by prey and ultimately trigger changes to prey populations and community properties (i.e., non-consumptive effects, NCEs). The implications of NCEs for particular communities, however, have proven difficult to anticipate in large part because anti-predator behavior is not generalized. Rather, prey responses to predation risk appear to be highly contingent, or context dependent. One of the main goals of our research program is to explore the sources of this contingency, asking whether and to what extent NCEs in particular cases hinge on predator hunting modes, prey escape tactics, and the setting of the predator-prey interaction (i.e., landscape context). 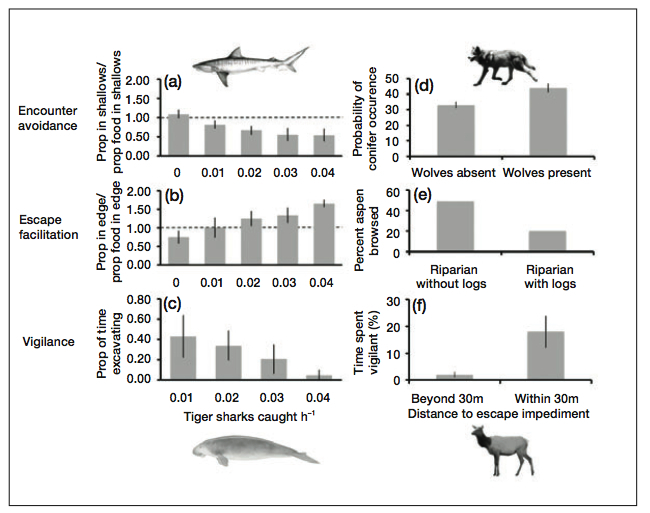 We are addressing these questions by focusing on interactions between tiger sharks (Galeocerdo cuvier) and large marine consumers (e.g., dugongs, Dugong dugon) in Shark Bay, Western Australia and between a variety of carnivores and their prey in the Pacific Northwest of the United States (e.g., between gray wolves, Canis lupus, and cervids in Washington's Okanogan Highlands; the recently completed Washington Wolf Project; between wolves and cougars (Puma concolor) as part of the ongoing Washington Predator-Prey Project). Our goal is to help develop a general framework that uses the drivers of behavioral contingency to better understand and presage risk effects and their community consequences (see figure from Wirsing et al. 2010 below). The development of such a framework is important for conservation, for it will enable more reliable prediction of the ecological impacts of losing predators from, and repatriating predators to, ecosystems. 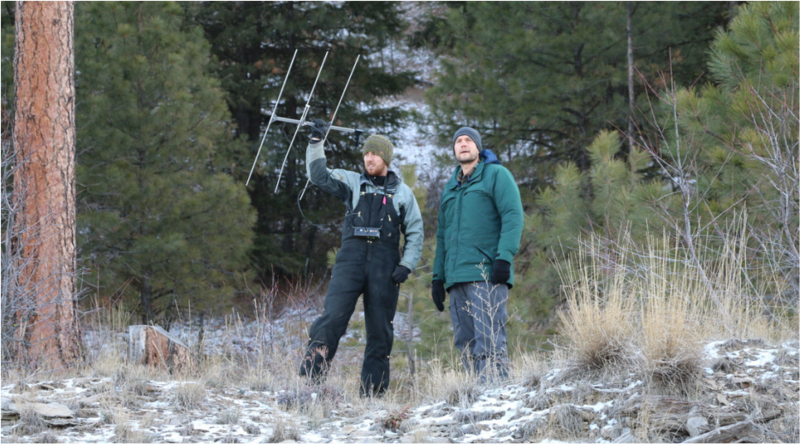 Ecologists working in aquatic and terrestrial environments rarely exchange information about their findings. Yet, where it has occured, communication across ecosystem boundaries has led to powerful new insights (e.g., the importance of spatial and temporal scale), popularized general processes (e.g., trophic cascades), and helped spread the use of experimental manipulation. Thus, there is great value in continued 'cross-pollination' of work in different environments. Accordingly, another goal of our research program is to demonstrate the benefits of an 'ecology without boundaries' approach that compares mechanisms underlying predator effects in different systems. 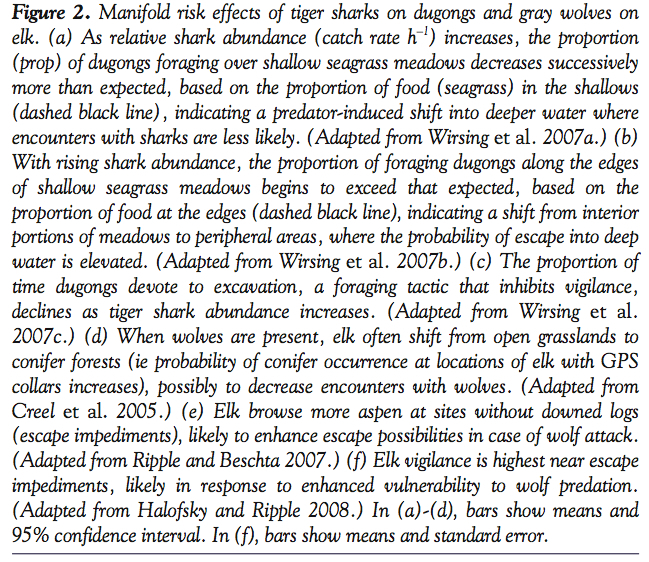 To that end, one of our recent papers (Wirsing and Ripple 2011) reveals remarkable similarity in the forms of anti-predator behavior that are elicited by gray wolves in the greater Yellowstone ecosystem, USA and tiger sharks in the coastal seagrass ecosystem of Shark Bay, Australia (see figure). Two other recent papers explore the benefits of cross-pollinating research to understand predator risk effects (Wirsing et al. 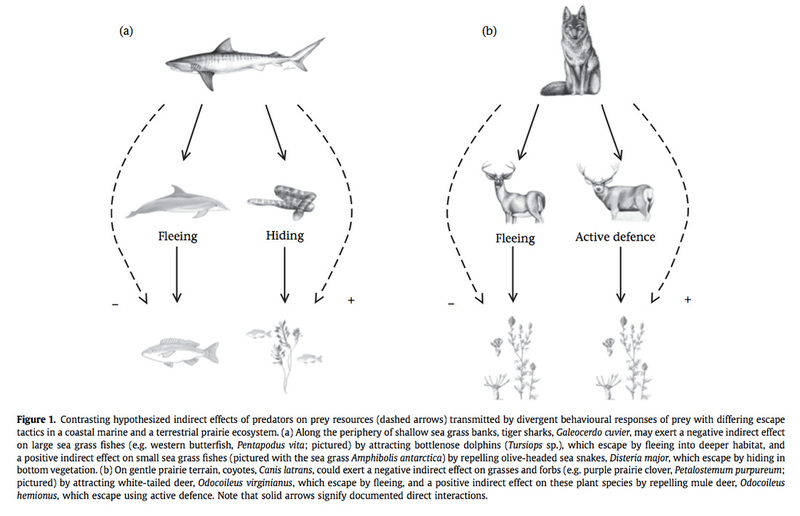 2014) and the ecology of top predators (Sergio et al. 2014). Snowshoe hare (Lepus americanus) populations in the northwestern United States tend to be low-density and show weak (or, arguably, no) cyclic activity. 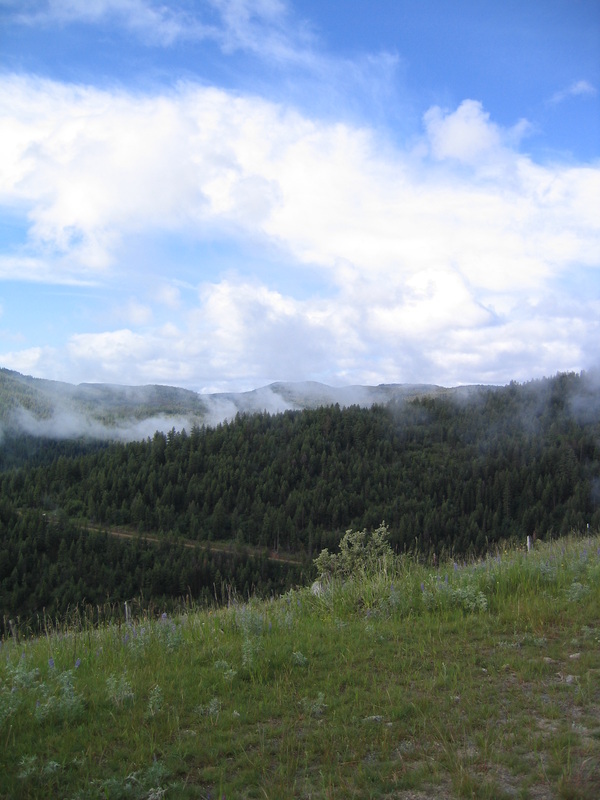 Previous work suggests that the weakeness or absence of cycles in this region owes to a combination of intense predation by a suite of generalists and habitat fragmentation (e.g., Wirsing et al. 2002). Broadly speaking, our lab is testing the generality of this explanation using sites in Washington. As part of this larger effort, specific studies include (1) examining the impact of forest management decisions on hare populations, and (2) exploring the implications of climate change (as it pertains to snow characteristics) for relationships between hares and their predators (particularly mesocarnivores such as Canada lynx, Lynx canadensis, bobcats, Lynx rufus, and coyotes, Canis latrans). Yes, I did once do fieldwork (here with a snowshoe hare caught at Lolo Pass in the Clearwater National Forest, Idaho, back in 1999). 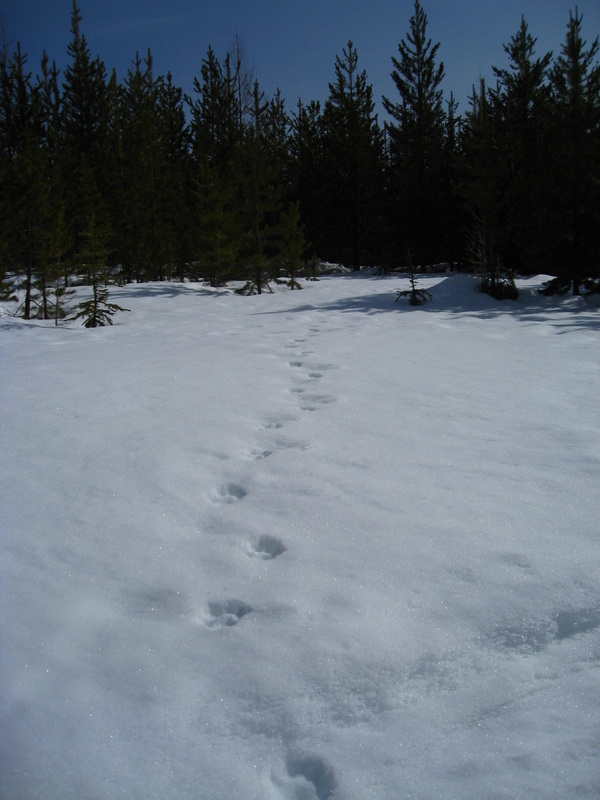 Lynx tracks in the Loomis State Forest (photo by Laurel Peelle). The annual return of salmon to spawn in freshwater lakes and streams along the northern Pacific Rim attracts huge numbers of brown bears (Ursus arctos), which through the act of predation deliver nutrients to terrestrial ecosystems. 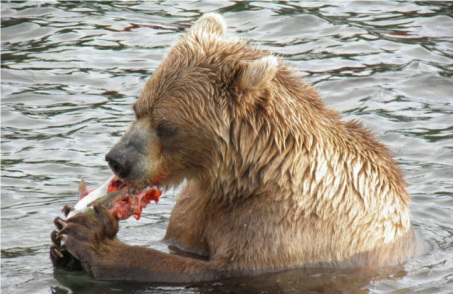 Despite the ecological importance of this celebrated predator-prey interaction, we currently know little about how individual bears respond to the presence of salmon outside of a few easily observable systems (e.g., the McNeil River). 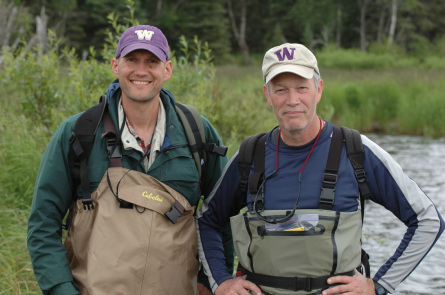 Accordingly, in 2012, we joined School of Aquatic and Fishery Sciences (SAFS) professor Tom Quinn to launch a non-invasive study of brown bear behavior along sockeye salmon (Oncorhynchus nerka) spawning streams in Bristol Bay, Alaska. We are using a combination of remote camera traps and DNA extracted from hair samples to characterize patterns of bear abundance, site fidelity, stream partitioning, and movement in relation to the timing and size of sockeye salmon runs in six streams flowing into Lake Aleknagik, where professor Quinn and colleagues have examined salmon consumption by bears since 1993. Thus far, we have published papers comparing the efficacy of motion-activated cameras and wire hair snares as non-invasive tools for monitoring bear populations (Quinn et al. 2014), showing that bear predation on salmon in any stream is influenced by a "neighborhood effect" (i.e., the availability of salmon in nearby streams; Quinn et al. 2017), and examining patterns of bear abundance and site fidelity in two salmon spawning stream networks (Wirsing et al. 2018). Starting in the summer of 2014, we joined Michael Heithaus and Jeremy Kiszka (Florida International University) to initiate a study of reef shark ecology in Tetiaroa, a remote atoll that is part of French Polynesia. French Polynesia is effectively the world's largest shark sanctuary, and Tetiaroa is privately owned and protected. Thus, it offers a rare chance to study sharks under relatively pristine conditions. Currently, we are using cutting-edge underwater camera technology to examine the abundance and behavior of lemon sharks (Negaprion acutiens) and blacktip reef sharks (Carcharhinus melanopterus) in Tetiaroa's lagoon, and have just published our first paper in Marine Ecology Progress Series (Kilfoil et al. 2017). Thanks to Jimmy Kilfoil and Kirk Gastrich of FIU for spearheading the fieldwork underlying this exciting research! This project is funded by the Seeley Family and sponsored by the Tetiaroa Society. Above: A juvenile blacktip reef shark cruises through one of Tetiaroa's nurseries.